Last weeks blog was on my laptop, ready to go except for two pictures which were on Bob’s computer. My laptop, which is less than 45 days old, would not start and is in for repair. Because the Geek Squad could not start it, they had to send it away. We could not transfer the data to a new computer, so I am unable to just trade it in for a new one. The repair will take 2-3 weeks, so I am using Bob’s laptop. I will post last weeks blog when I get my laptop back. Saturday- Moving day! We left the Freightliner facility in Gaffney and drove south on I-85 to I-26 east. 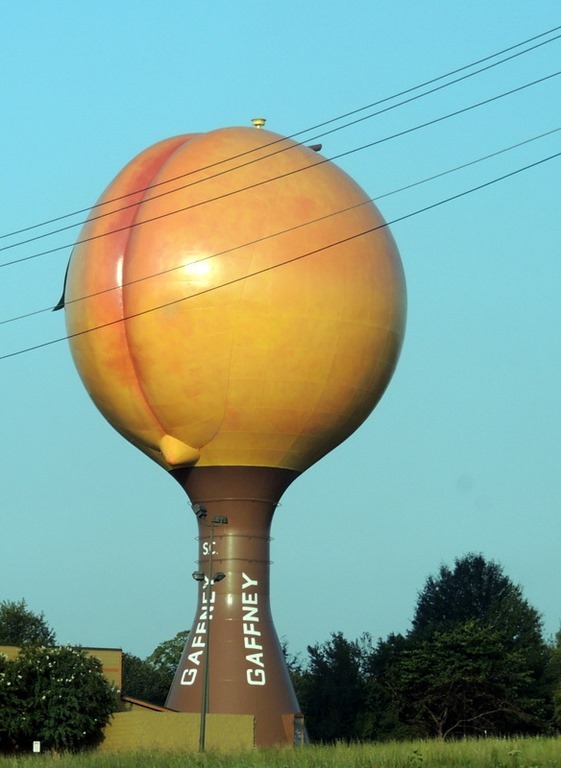 As soon as we entered I-85 south we passed the famous Gaffney Peach water tower. South Carolina advertises that their peaches are sweeter than Georgia peaches. We traveled east to North Charleston moving into the JB Famcamp located on the airforce base. What a beautiful place! We had specific instructions on how to enter the base. 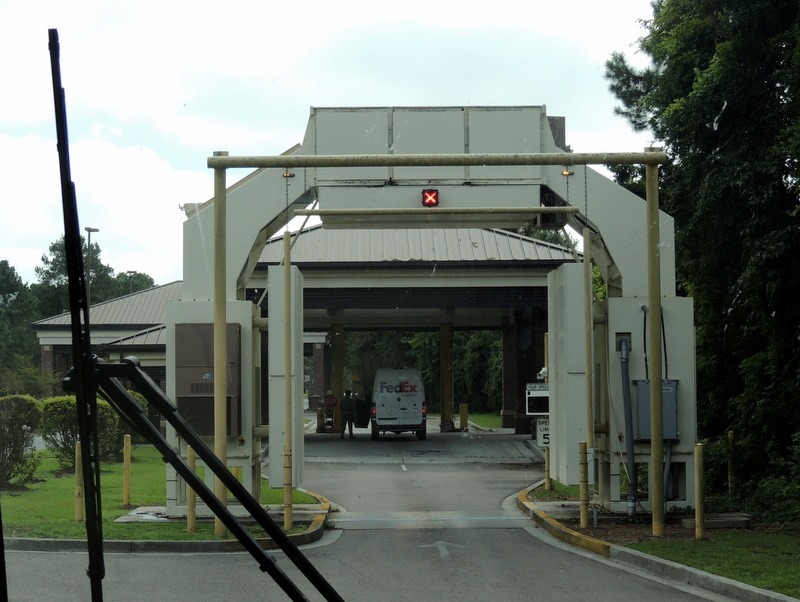 The gate we were using had a large X-ray machine and we had to go through that on the way in. There was only a FedEx truck ahead of us at the entrance. The guard looked at our ID’s and we were waved on. We drove about a mile into the base and turned right into the campground. We stopped in the parking lot and disconnected the car. While we were doing that, Bob and Gwen, the camp-hosts, showed up in their golf cart. They guided us to a really nice site, #22. The roads are asphalt, the pad is concrete, with an area for a nice picnic table. Both Bob’s figured out where the MH needed to be positioned so we could receive the satellite feed; we parked and set up. Gwen gave us about 15 minutes and came back to collect our $23 per night for FHU 50 amp. Wow, are we happy with this place! We are located right off I-26, about 6 miles north of Charleston. The Famcamp is small, only about 35 sites, but it is very nice!! We settled in and I started laundry. I was able to do 4 loads before bedtime. Bob took a short nap and I worked on cleaning out the apps on my cell phone and read. We ate dinner in, watched TV and went to bed. We discovered that Revelry is 7 AM and Taps is at 10 PM, and they ‘retire the colors’ at 4:30 each day, playing the Star Spangle Banner. Different than the base in Boston! Sunday- We did our usual Sunday tasks of budgeting etc. We left at about 9:30 and went into the city. We went straight to the Visitor Center. We parked in the parking garage for $2 per hour, $16 for all day. We purchased tickets for the Grayline Tour. We boarded the nice air conditioned van for the 2 hour tour. There are lots of horse drawn carriage tours, but the weather was upper 90’s and very humid. Even the Charleston natives were complaining about how humid it is due to tropical storm Julia, which has been stuck off the coast for quite awhile now. Our tour guide was Bob Poe. He was a hoot! He talked very fast, as he likes to get all the info in that he can. He had a laugh and spit a lot when talking, with his very southern accent. He did a good job though. Because we were in the city, I was unable to get a lot of pictures. There were hundreds of picturesque houses and I was only able to get pictures of a few from the van. I will have more another day. 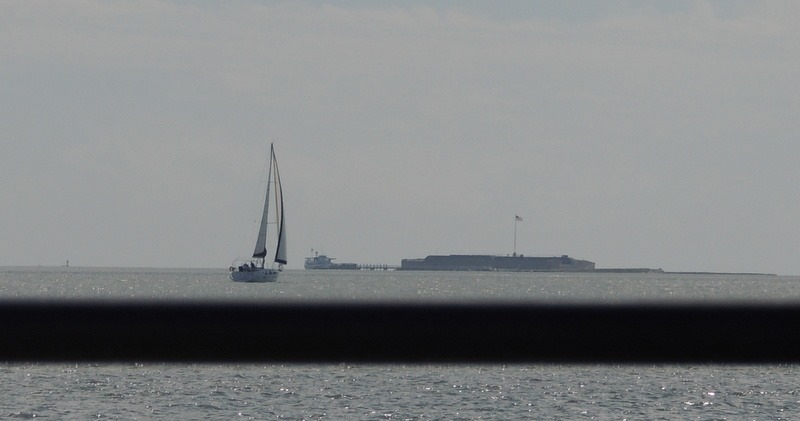 We stopped at the seawall and were able to leave the van to look at Ft. Sumter in the distance. 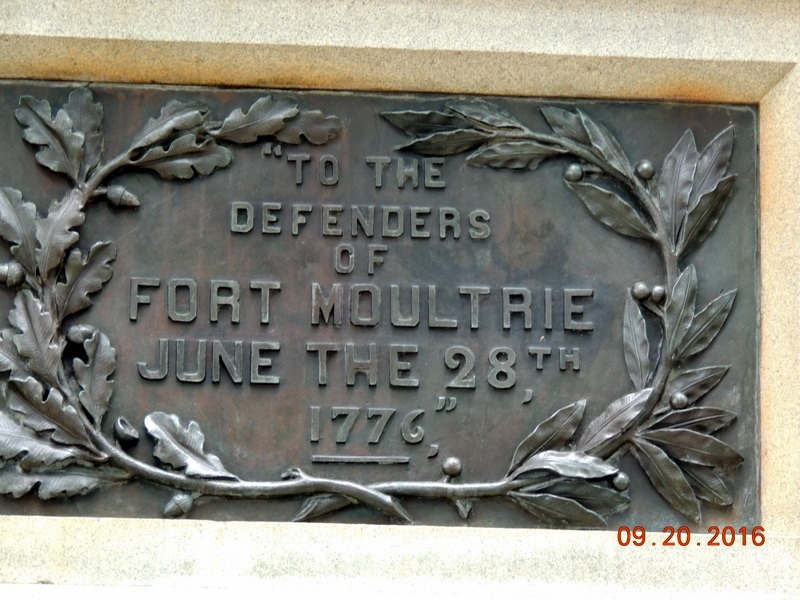 We were also able to set Ft. Moultrie. It was closer to us. It has an interesting history. 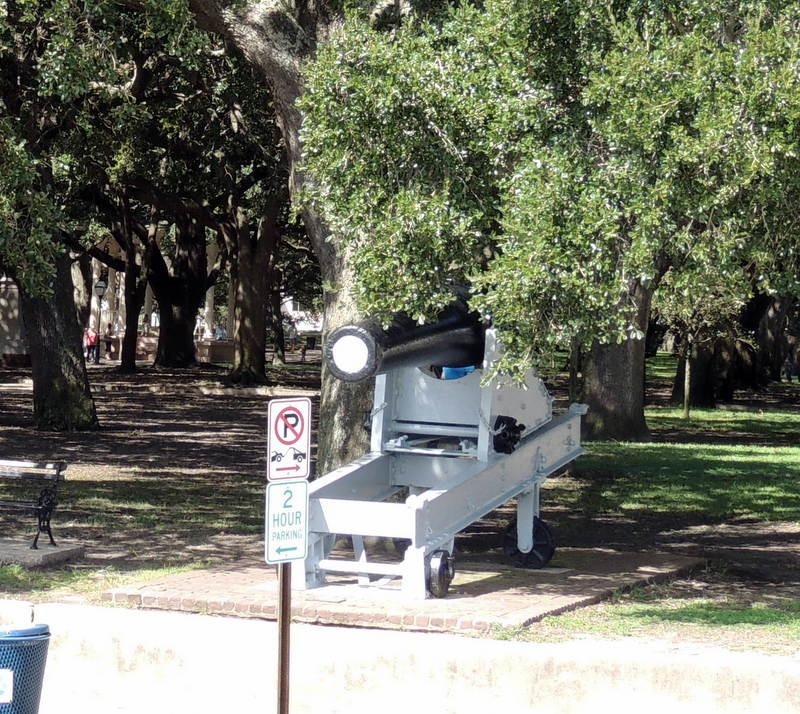 The fort was built from palmetto tree wood. The British and the Patriots thought it would never hold up under an assault. The Brits shot cannon balls at the fort and it just absorbed them. The Brits left and came back with more ships to do it again and the Patriots lobbed back the British cannon balls at them. This was a major victory for the patriots. 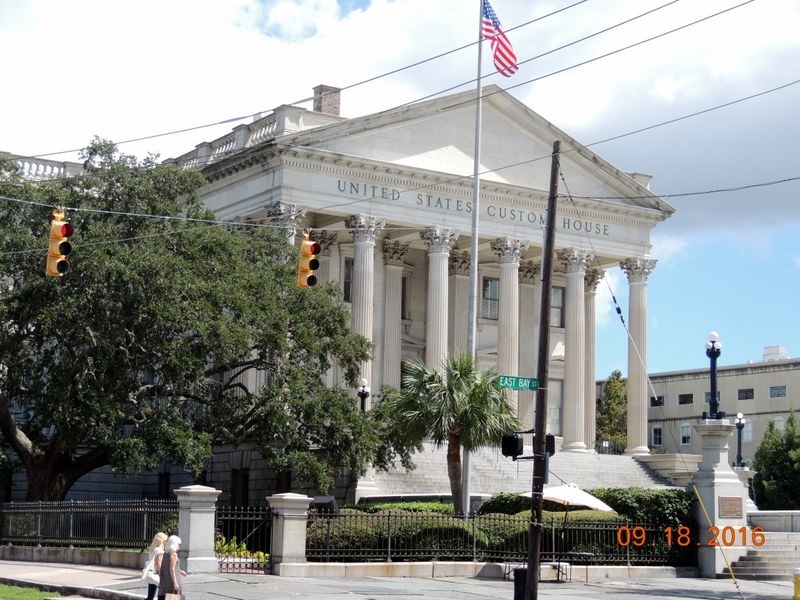 Now we know why the Palmetto is the state tree and is on the state flag. The flag in the picture below is a replica of the flag flying over the fort during the battle. Above is one of the cannons that the Patriots used to fight the British. 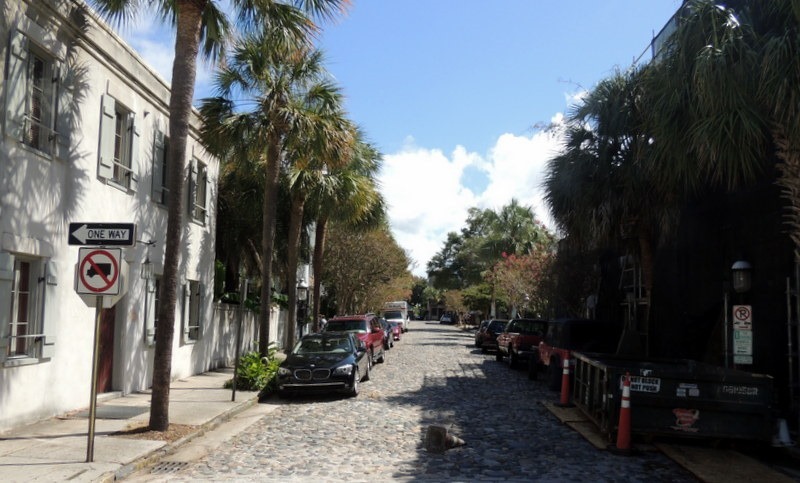 Below is a cobble stone street. 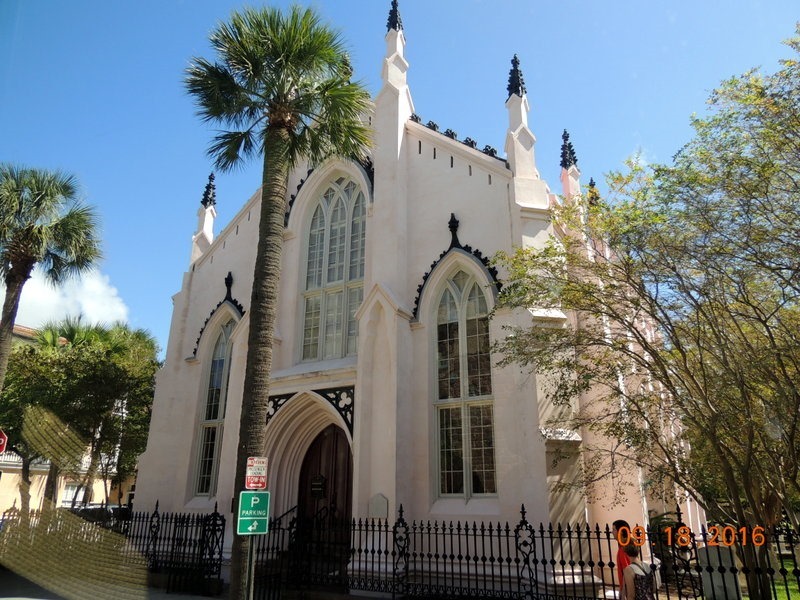 Above is the oldest church in Charleston. 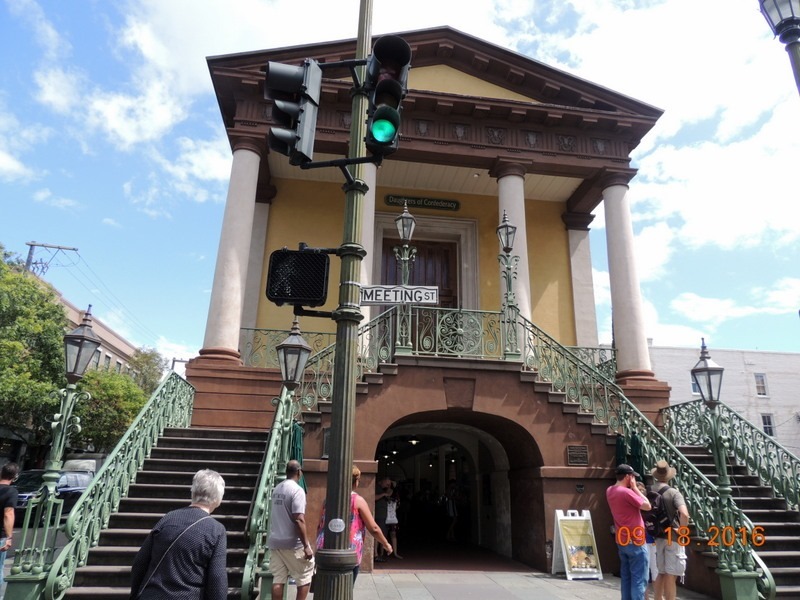 Bob returned us to the Visitor Center and we took the free city trolley back to the Charleston Market area. We hopped off the trolley and walked over a block and a half. 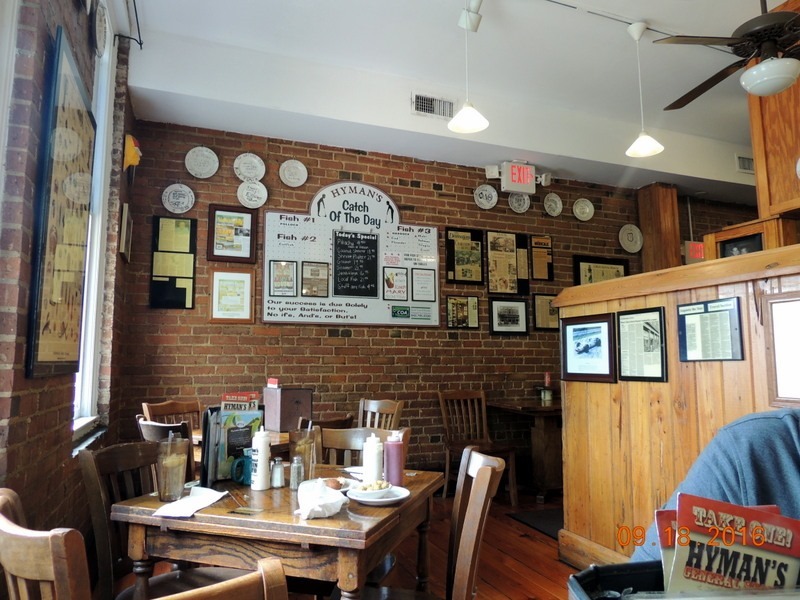 Our destination was Sticky Fingers BBQ restaurant that tour guide Bob thought highly of, but on the way, we ran into a man from Hymans Seafood ( also on our to do list) and he gave us each a free, large hush puppy and a coupon for a free appetizer at Hymans. So we stopped in there. There was no line, which evidently is unusual, and we were quickly seated. Hymans is famous in Charleston. On their brochure they have listed a lot of famous people who have eaten there. There were plaques on the table noting who had sat at each table. Ours had Tony Dorset, Vicki Lawrence, Rick Flair, and Erma Bombeck! The food was awesome! Bob had wanted to try fried green tomatoes so we had that as our free appetizer. We were supposed to have two entree’s to get the free appetizer, but our waiter, Kyle, asked us if we just wanted the fried green tomatoes, without the fixings. He said he could give us those using the coupon. So we had them. Bob had the coconut shrimp special and I had the shrimp tacos. We had a lot of food. The tacos are not an entrée. Each came with delicious coleslaw and two big hush puppies. Kyle also delivered a plate of four big hush puppies. We waddled out of the restaurant through the gift shop. The manager came to each table and greeted the diners. When he spoke with us he asked if we had been there before. We said no and he told us, that is okay, you will be back. Before we left we told him he was right, we will return next time we are in Charleston! We highly recommend this restaurant!! 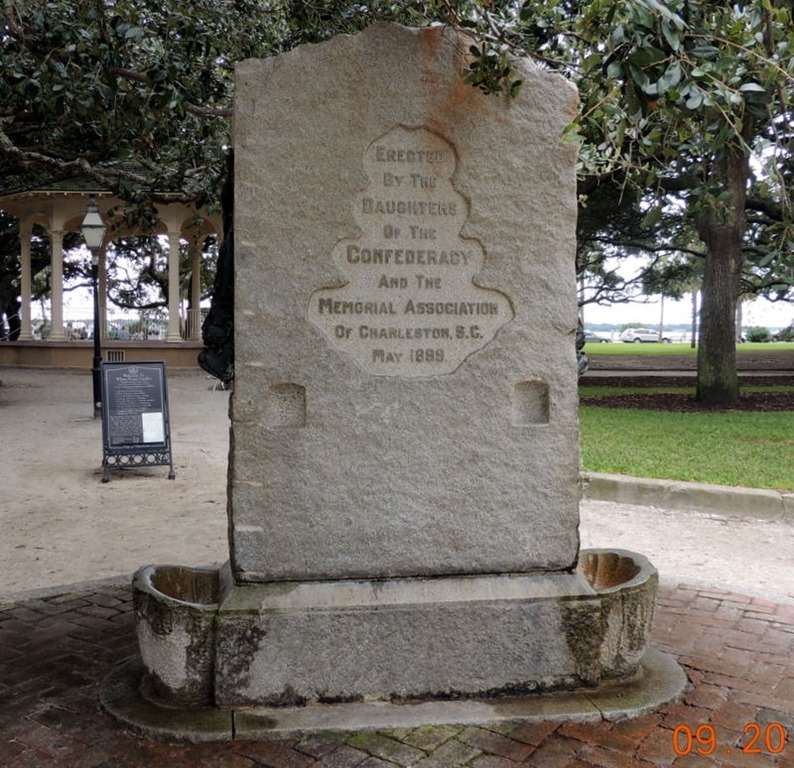 We walked back down the street to the Charleston Slave Market. 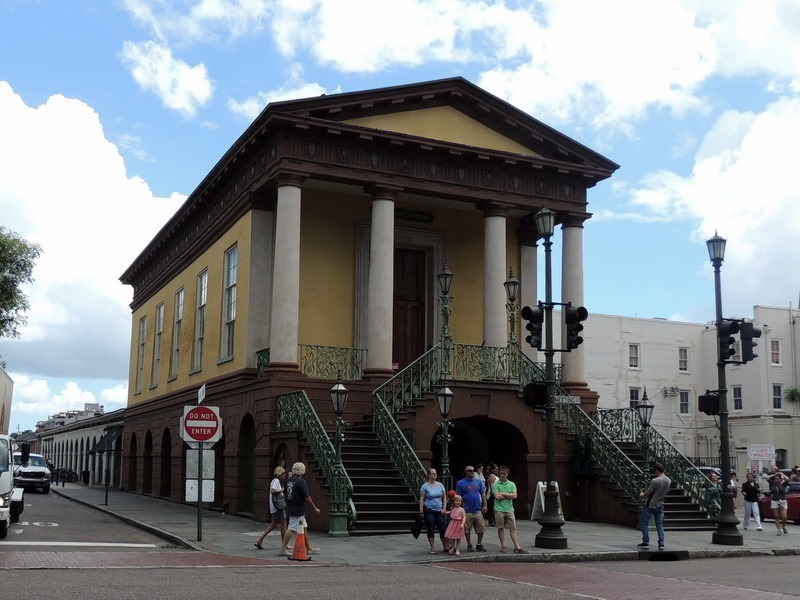 It is not where they sold the slaves, it was run by the slaves, selling the local items. It is fuve blocks long and is mostly an open market. It was hot and humid inside. Midway through, in the third block, it was air conditioned. Good thing, as we were able to cool off a bit. We did not purchase anything, as lots of items were very expensive. Living in a MH, we cannot purchase a lot of stuff, which is a good thing! 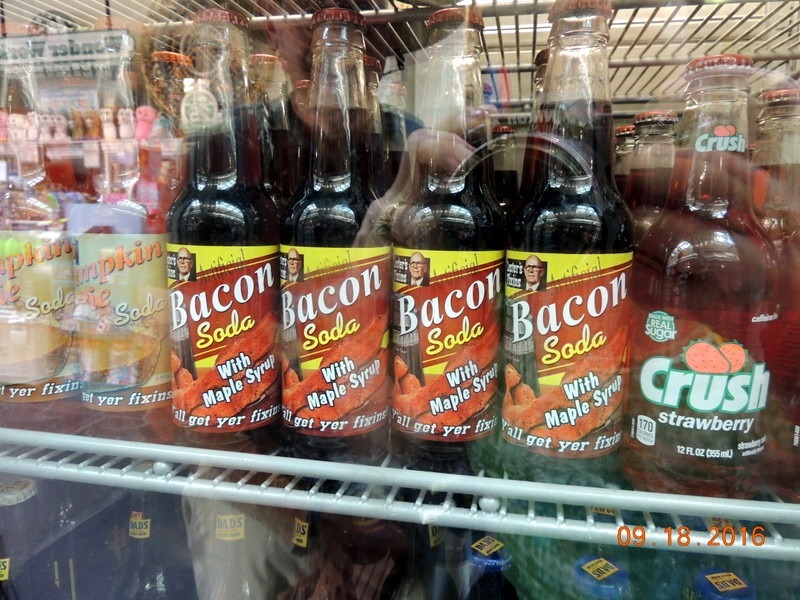 We did see these though… Ranch Dressing soda, Bacon soda?? No we did not try them! Yuk!! Behind the market was the Custom House. We returned on the to the visitor center parking garage. We paid $10 for the parking and returned to the MH. We ate dinner, watched TV and went to bed. Monday- Bob took the sheets and towels across the street from the MH to the laundry. $1.75 to wash and $1.75 to dry for 1 hour! Very nice. We left at 10 AM driving back north on I-26 to Columbia. We arrived at 11:45 at the Applebees, right off the interstate. 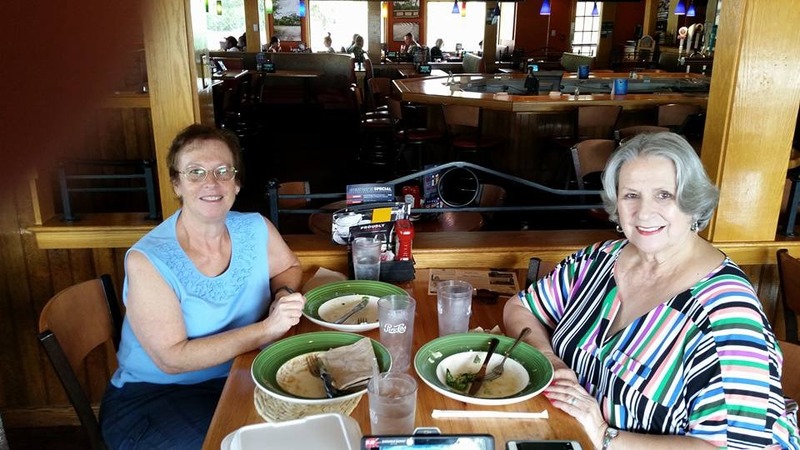 We were meeting up with long time friend, and one of my health coach clients, Sandra Johnston. we had not seen Sandra since 2014. Sandra lives in Greenwood and this was about half way between. Between the two of us we have lost over 80 lbs! We had a great lunch, catching up with her. We left at about 2:30 and drove back to Charleston, stopping at an NFCU branch to have our request for absentee ballots notarized. We arrived to find the place mobbed! Wow, was it busy. We finally found seats and waited for our turn. Evidently, the notary was not all that busy, because we suddenly were called to the counter. She notarized both of our forms and we were back on the road in about 20 minutes. We returned home, Bob walked the dogs, and it started to rain. We had two thunderstorms this evening. We ate dinner, watched TV and went to bed. Tuesday- We left around 9:30 and went to the Nathanial Russell House Museum. We hunted for a parking place. All the signs are clear as mud. We finally decided to stop at an open spot that said “2 hour parking, Resident parking pass B”. Huh? We were confused. So we parked and went into the Museum. We asked at the desk and were told that it is okay to park for 2 hours, you just need a resident parking sticker to park for longer than 2 hours. They agreed that the signs were confusing. Okay! We paid the $12 each to tour the house. 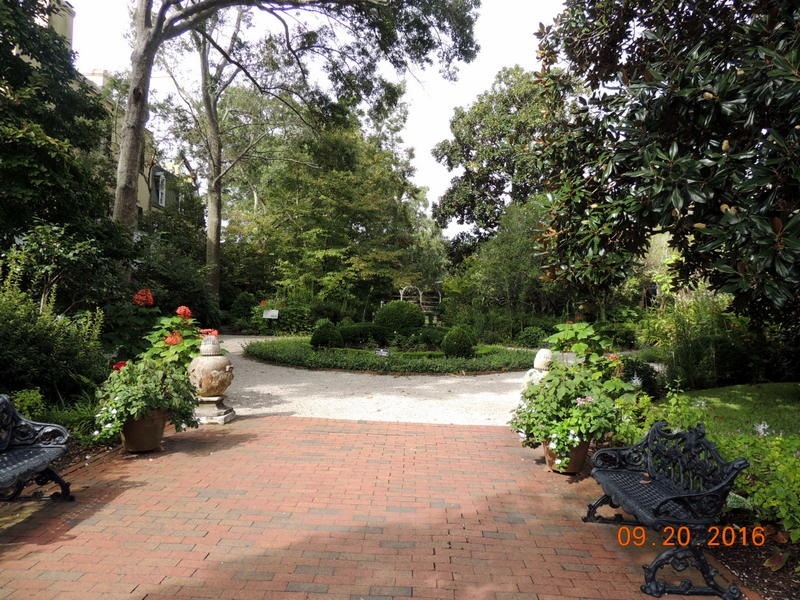 Below is the garden which we walked through to get to the reception area. Above is the side of the house. The house consists of 3 stories and each story has three rooms. Two are square and the center is oval. To access the balcony above you have to exit through the windows. 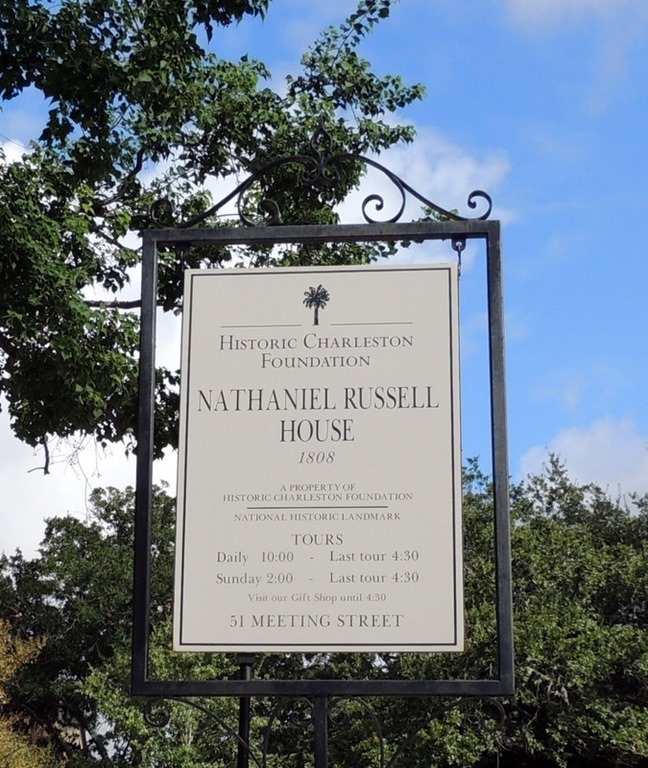 The Russell House was completed in 1808. 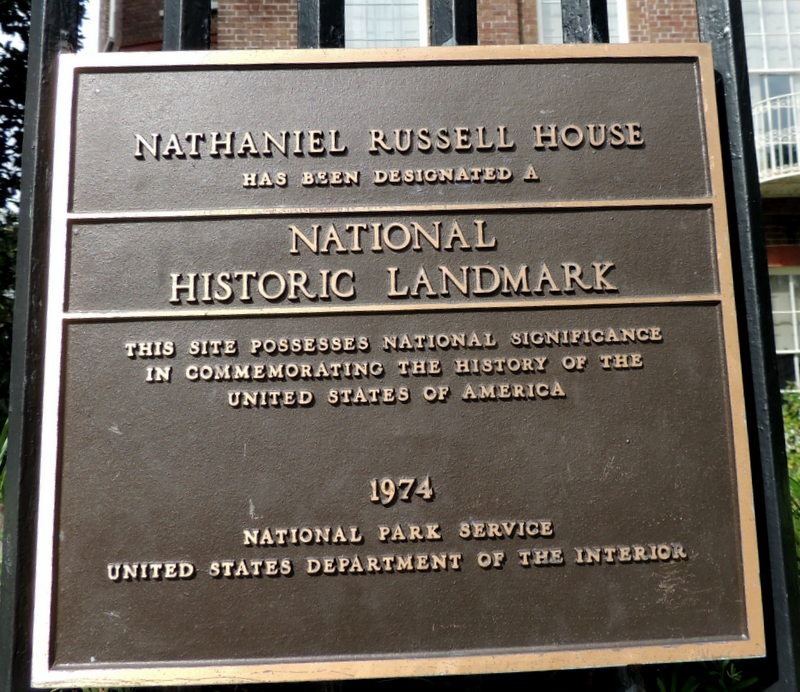 Nathanial Russell was an import/export merchant, who was one of the few who sent his ships to the orient, as well as England. 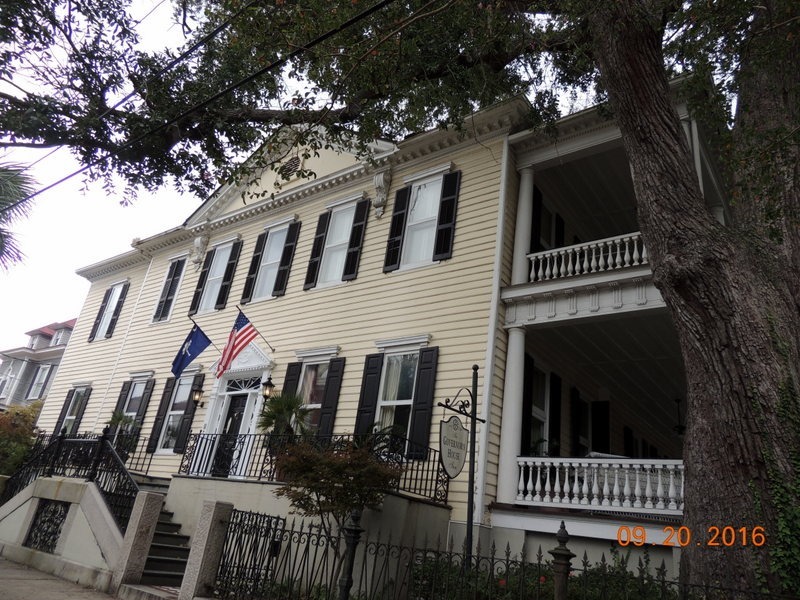 He exported rice, indigo, and cotton, the two staples of SC at the time. 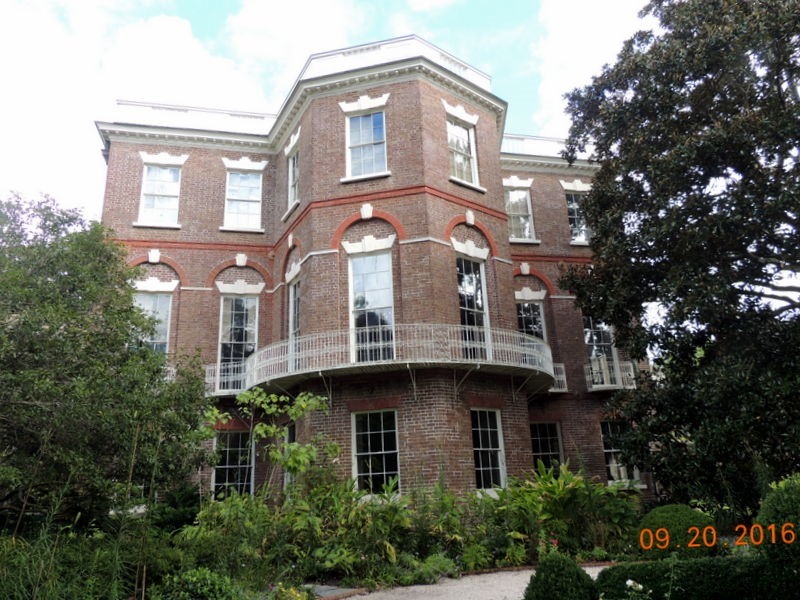 He imported goods, such as textiles, china, tea, and slaves. 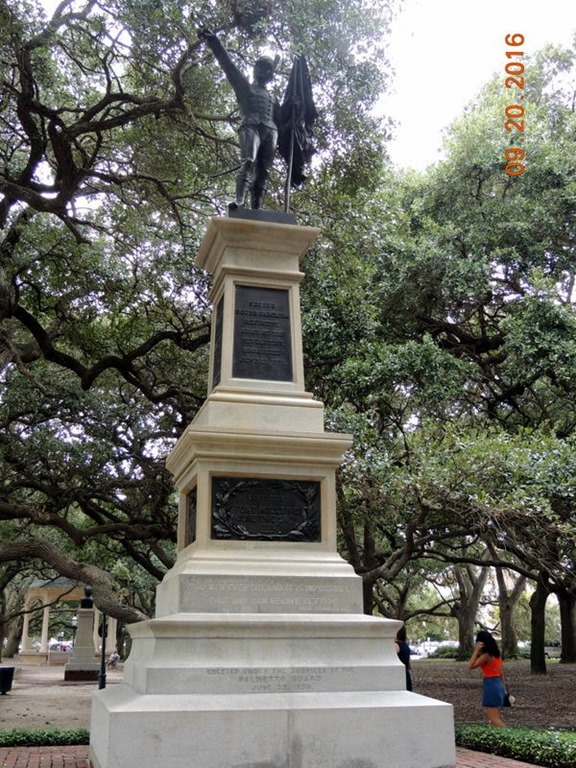 At one point he was the wealthiest merchant in Charleston. 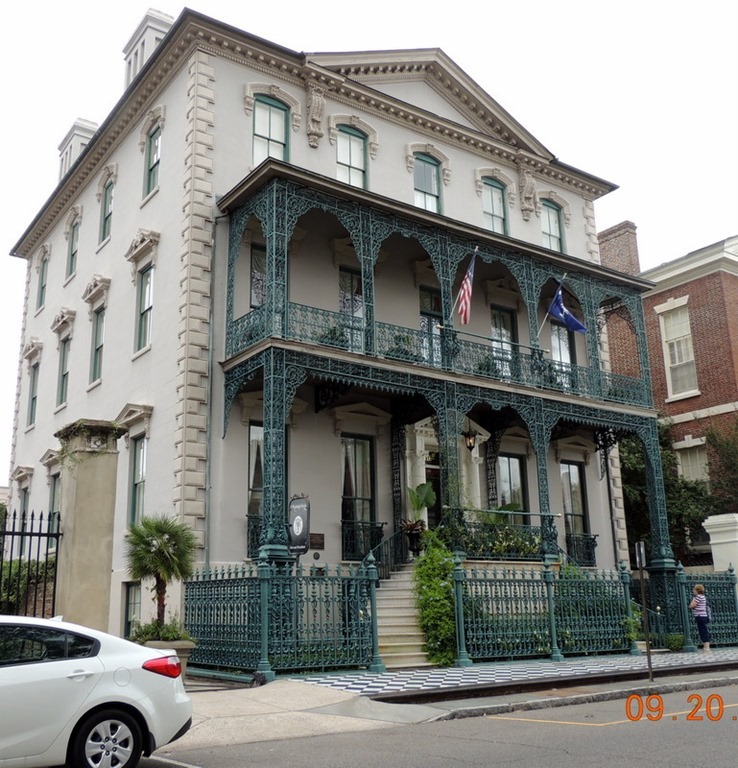 The family had 18 slaves at the house. He did not marry until he was in his 50’s. 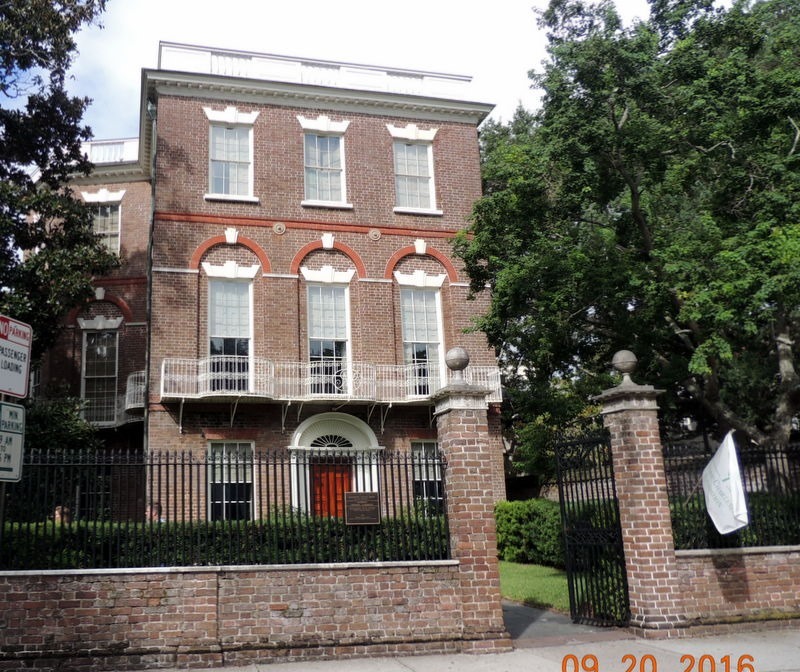 He married a rich Charleston woman, Sara, who gave him entry into Charleston society. Sara was rich enough that she did not have to marry, and she was 36 years old. She did pre-nups and other contracts to protect her independence, and other men would not marry her. They had two daughters. The grandchildren eventually sold the house. 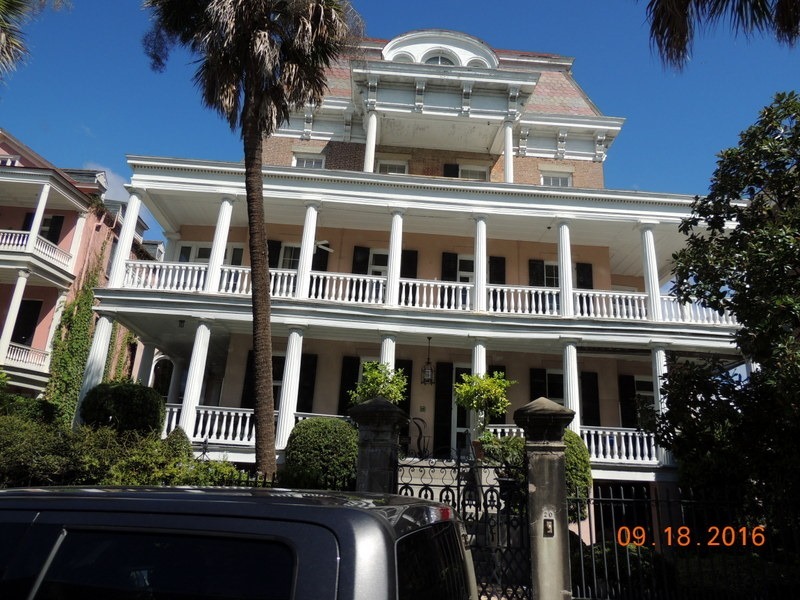 Many families and some nuns lived there before it was purchased by the Historic Charleston Foundation who runs it now. 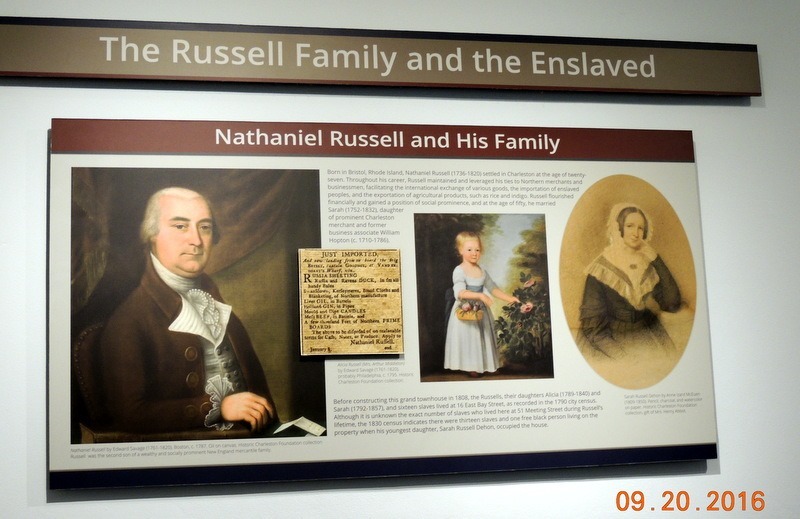 Below is a picture of Nathaniel and his two daughters. There are no pictures of Sara, as they were all burned during the Civil War. Our tour guide was Ken. He knew his stuff, but he would never have been our favorite tour guide. He was stuck up and very stiff; very formal. Actually, so was the lady at the desk who took our money. They were both very stuffy, condescending southerners. But the house was very interesting. The back area of the house was the kitchen and slave area. Where the entrance is located is in this area. Originally, the house and the kitchen area were separate, to prevent fires. Now they have joined them with the modern visitor center which includes restrooms and a small museum. Below is Ken in the reception area. Next to it is the office. The doors were gorgeous! We took the 10:30 45 minute tour starting in this area. Here is an interesting item, a tag. ( my picture did not come out). All the slaves had to wear tags which showed if they were slaves or free blacks. It also showed their position, such as blacksmith, house servant etc. At street level the tour started with Nathanial’s reception area and office. The reception area and the office were closed off from the residence by these beautiful doors. There were twenty layers of paint on all the walls, which were carefully removed down to when the Russell’s owned the house. 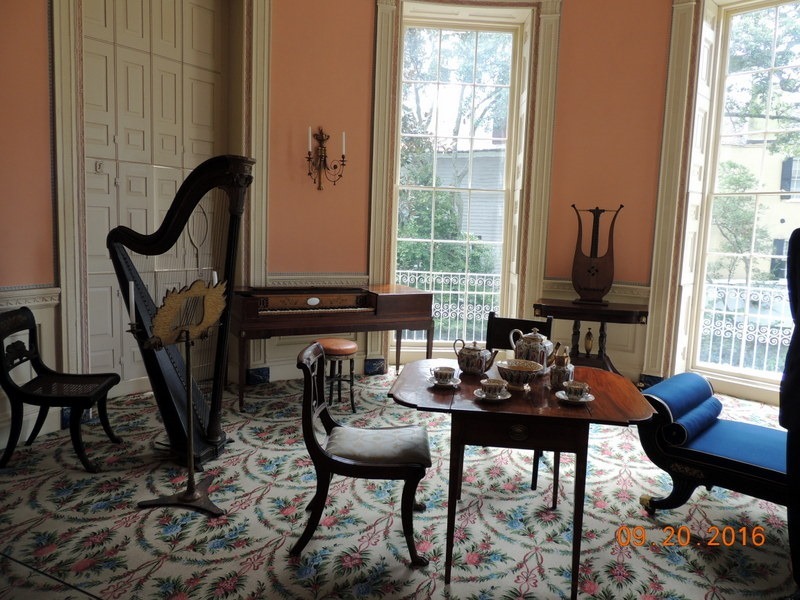 All the colors match the original, but the furniture is from the period, not original, as the house was looted during the Civil War. 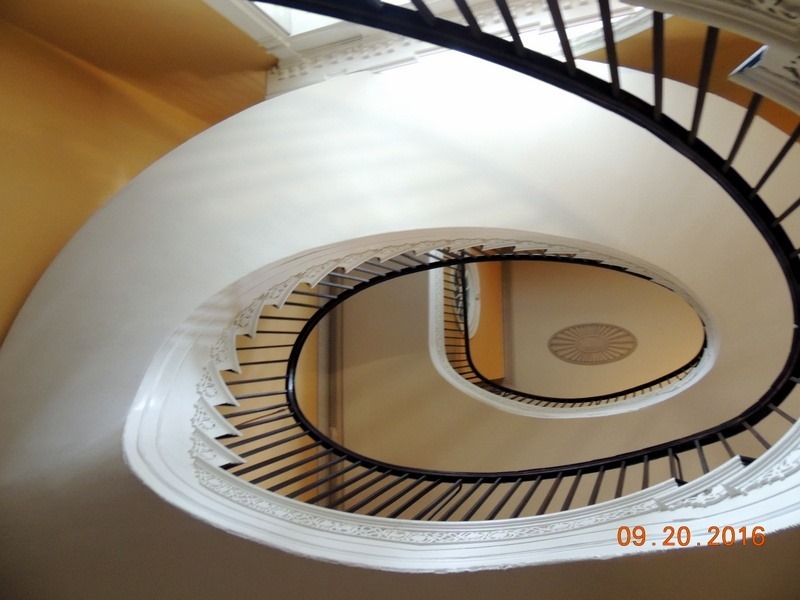 This house is famous for it’s magnificent free-flying staircase. 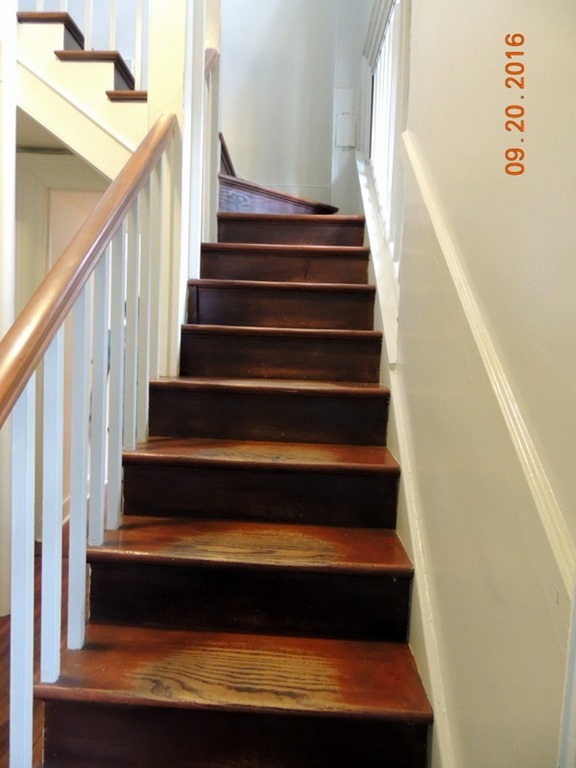 Because so many visitors walked on the staircase, it was deteriorating, so you can no longer walk on the staircase. We used the servants stairs to climb to the second floor. 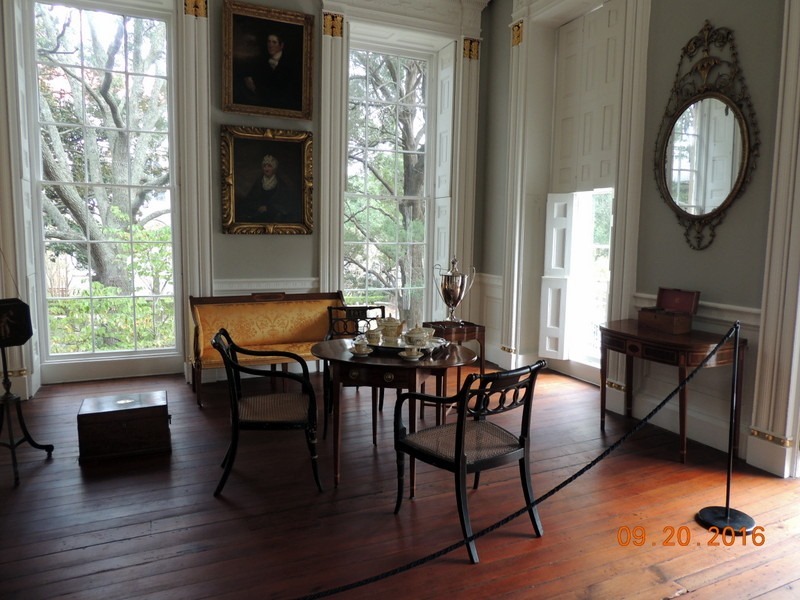 Above is the formal dining room. Below is the private dining room. Because it was so hot, the family used the family dining room wearing only their underwear. 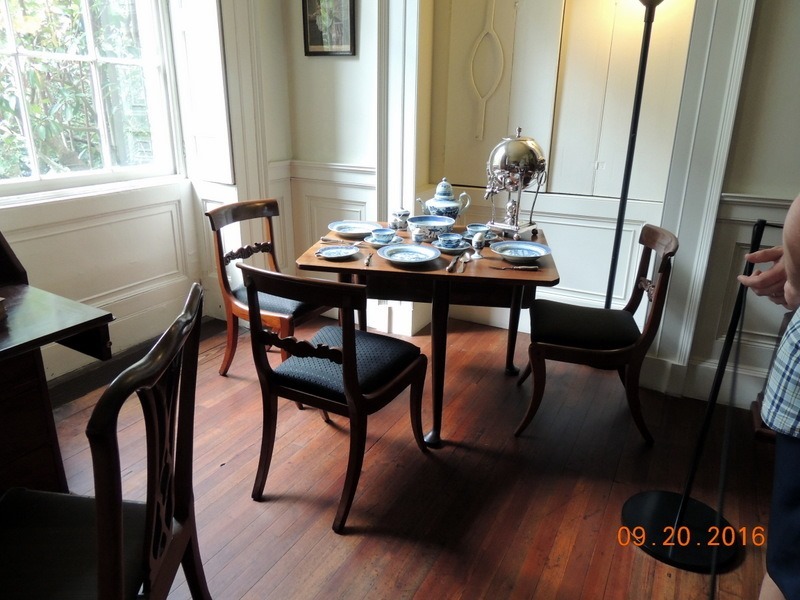 They did not feel it was appropriate to use the formal dining room in their skivvies! Below are the servants stairs. 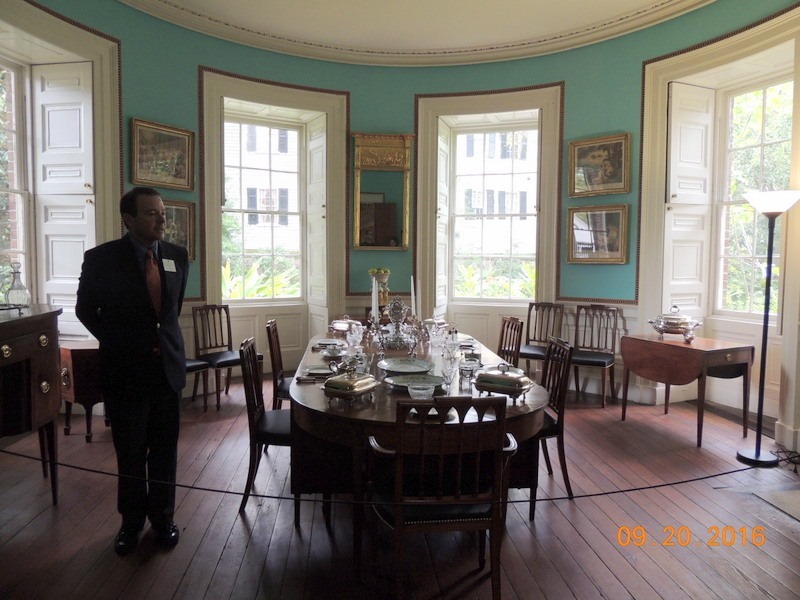 Above is the formal drawing room where guests were welcome. 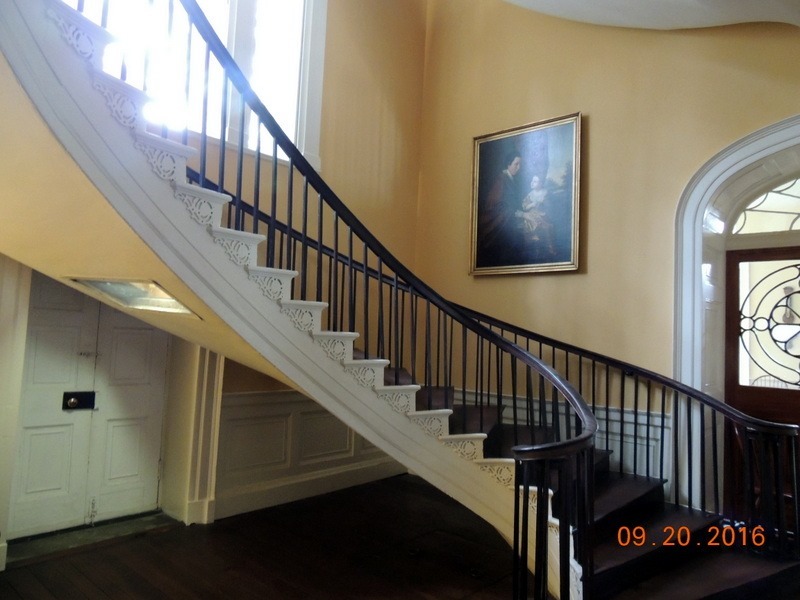 It is on the second floor and quite ornate. The picture does not do the gold and the decorations justice! 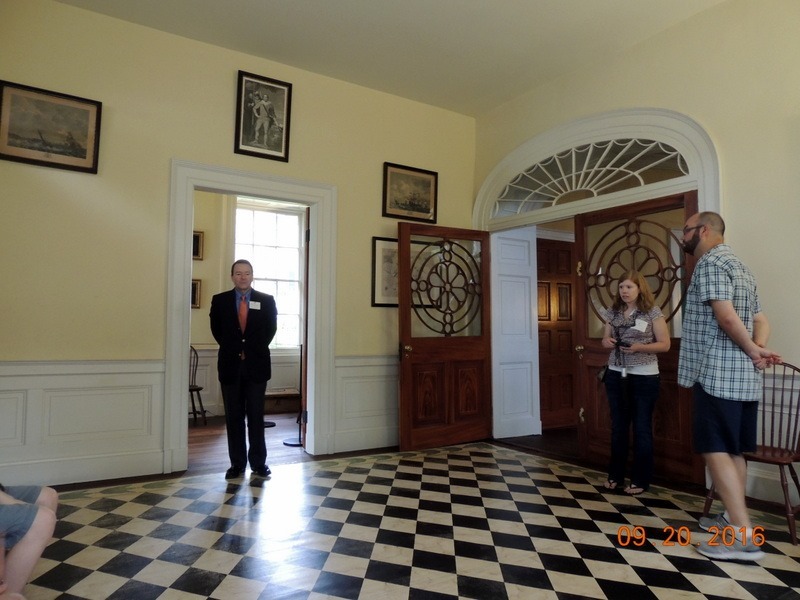 The tour only went to the first and second floor, because the house is not meeting code to take people to the third floor, plus they have not renovated that floor. The second floor is where the formal area master bedroom are located. The top floor had the daughters rooms and Sara’s room. During the summers, Sara went to England and Nathanial went to the country estate. 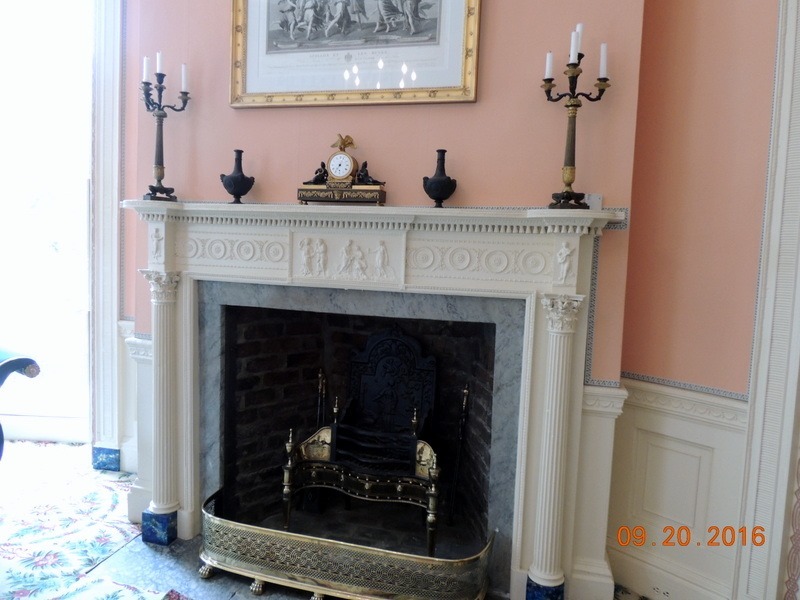 Below is the ornate fireplace in the music room. The carpeting in this room is wall to wall. The rug is from England and is made with a pattern from that time period. I asked Ken how they cleaned it. During the ‘season” the carpet was swept by the servants/slaves. In the summer when the family were all gone, the servants (slaves) took the rug apart. There are lines which are sewn together and the rug is taken apart and they take it outside to beat the dirt out. 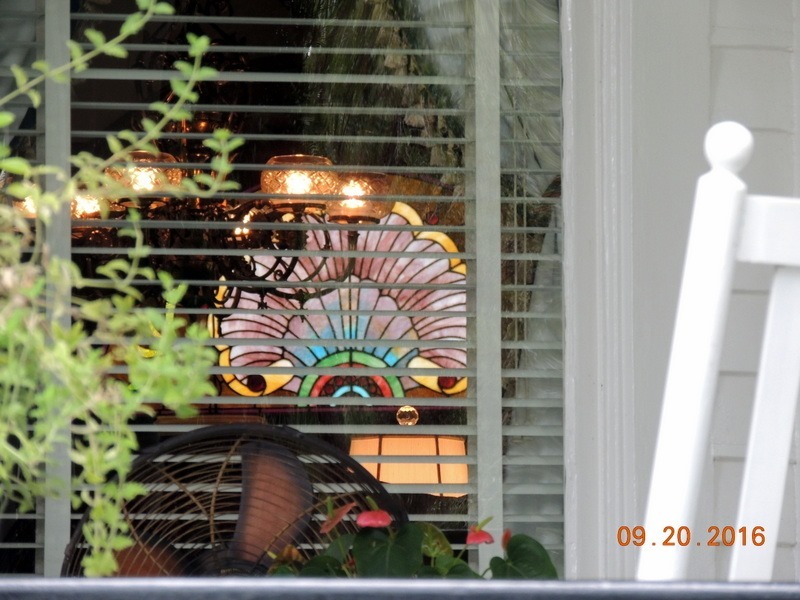 It would have been put back into the house in September before the family arrived back in town. All the rooms had the carpeting, as the floors are made of pine. 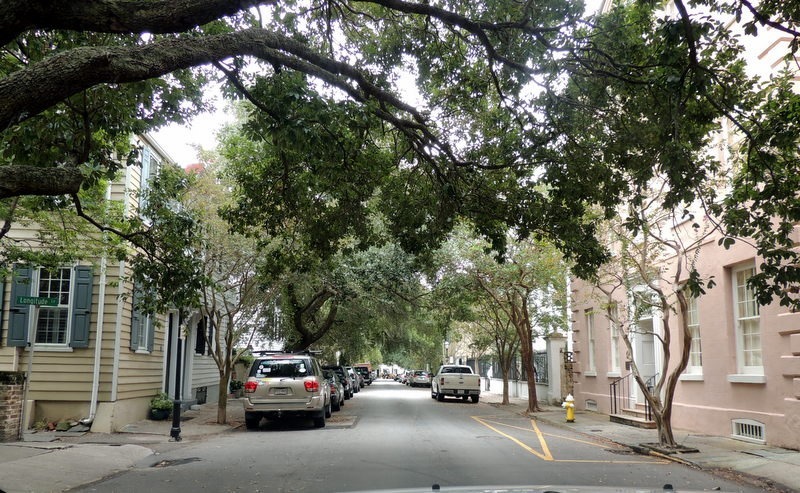 The SC pine has a sap that repels termites, which are a big issue in Charleston. 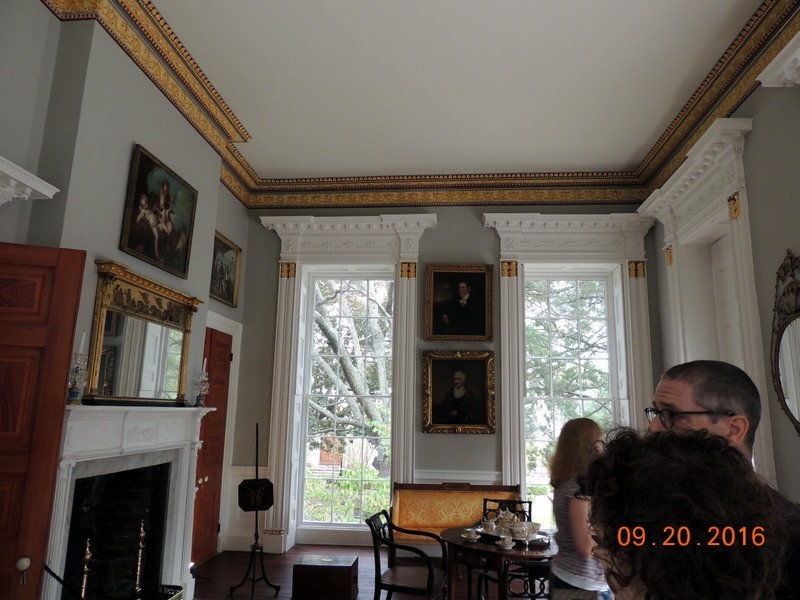 We visited Nathaniel’s bedroom, but it is being restored so there was not much to see. We left and drove through town. Below is one of the streets we used. Almost every house has a plaque on it telling the story of the house and who lived in it. 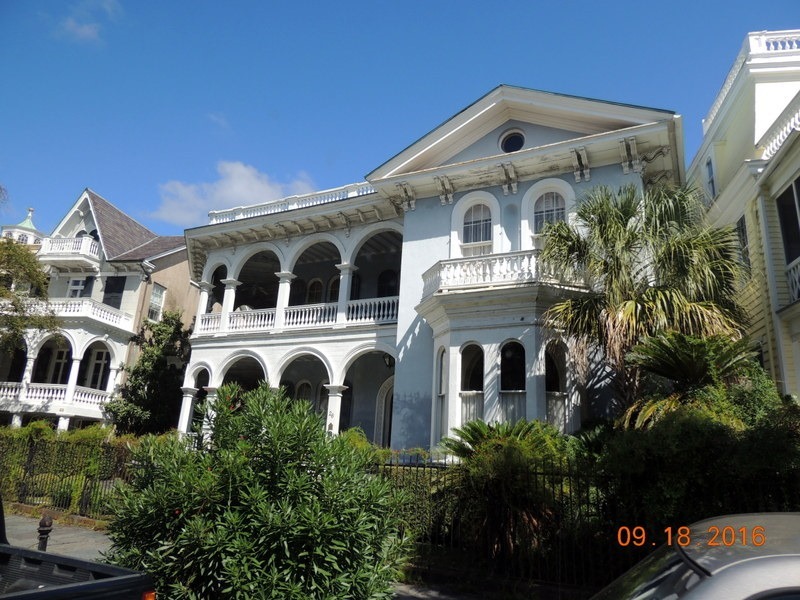 Houses may only be renovated or restored, they may not be torn down. 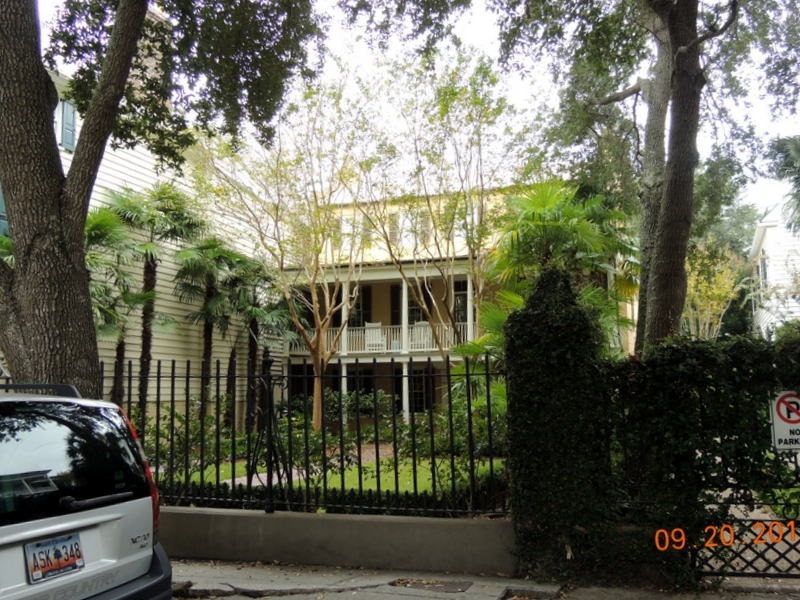 New construction has to be approved and must be appropriate to the city, matching the other homes. We traveled down past the beautiful houses and gardens. The house below is a famous B&B, listed as the best in the country. 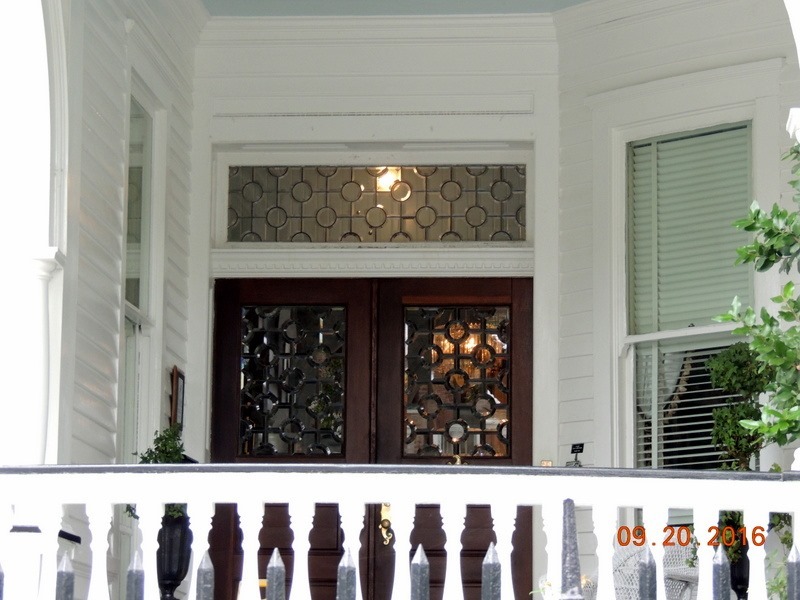 Above is the Tiffney doors and a Tiffany glass inside the house. We crossed the street and went to White Garden Park. Above is the first house on Rainbow Road. It belonged to a dentist. When he was asked why pink, he said it was his favorite color because it is the color of healthy gums. Here was a pretty garden in front of a house. 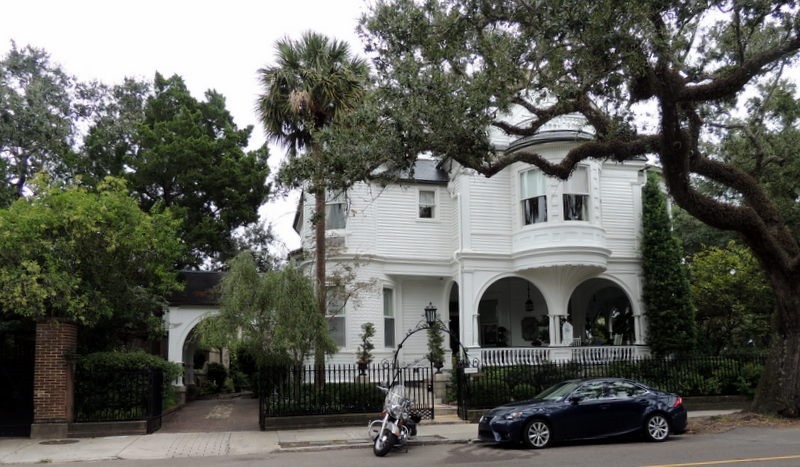 Above is the Governors Mansion, now a B & B and his brother’s home across the street, also a B&B. The brother was elected to the Senate and was an ambassador. Note the iron grill out front, it is pressed iron. We went in search of another parking place and found one at a meter. We went to lunch at “Sticky Fingers” a rib and BBQ place, actually more Memphis than SC. Here is a picture of Stephen Colbert who is from Charleston and has eaten at the restaurant as well as George W Bush. We left and went to Kohl’s for me to use my birthday and other coupons. I bought 4 tops and one pair of capris all for $28, after the discounts. We returned home, walked the dogs, fed them, made our next reservation and went to dinner at La Hacienda. 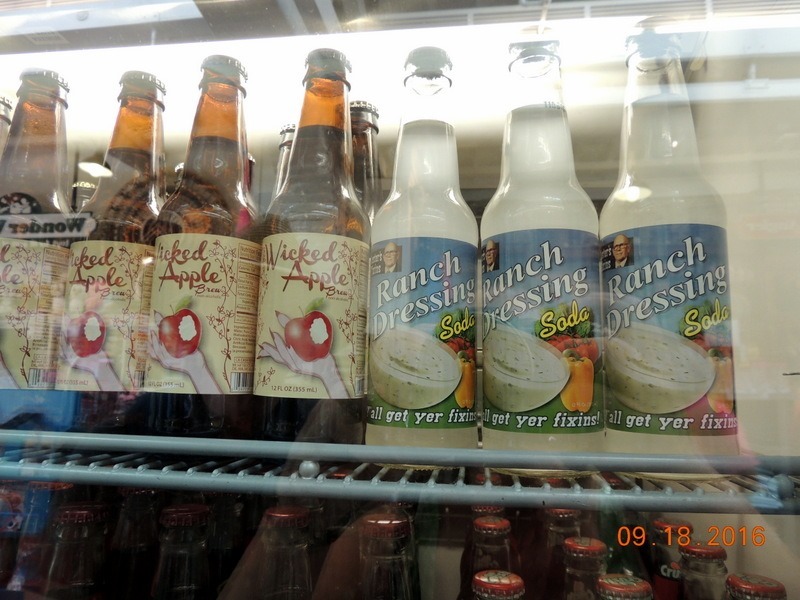 This is a local restaurant, not affiliated with the one out west. The food was okay, but not as good! We would not go there again. Wednesday- We left at about 9:30 to go to activities office at the base, which is right at the RV Park entrance and asked if we were eligible to purchase discount tickets. The gal said that if you are eligible to be on the base you are eligible to purchase tickets. 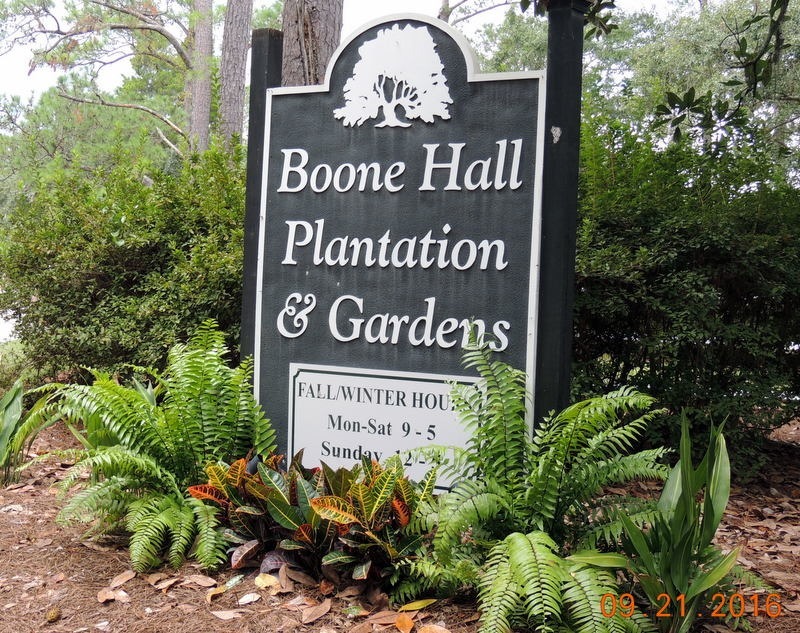 So we purchased tickets for Boone Hall Plantation for $15 each. The online and at the door tickets were $23, so we had a significant savings! The camp host, Bob, was there. 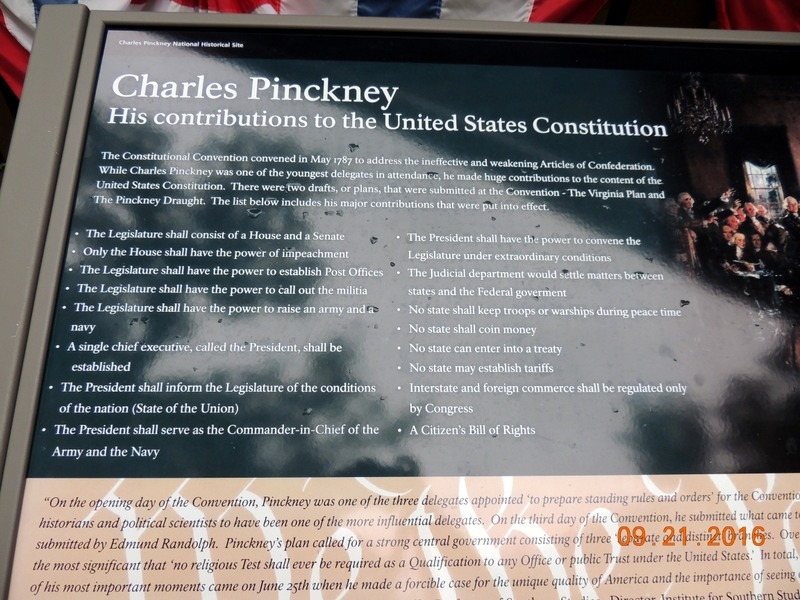 He asked us where we were going and he told us to go across the street to the Charles Pinkney National Historic Site also. So we drove about 1/2 hour to get there. 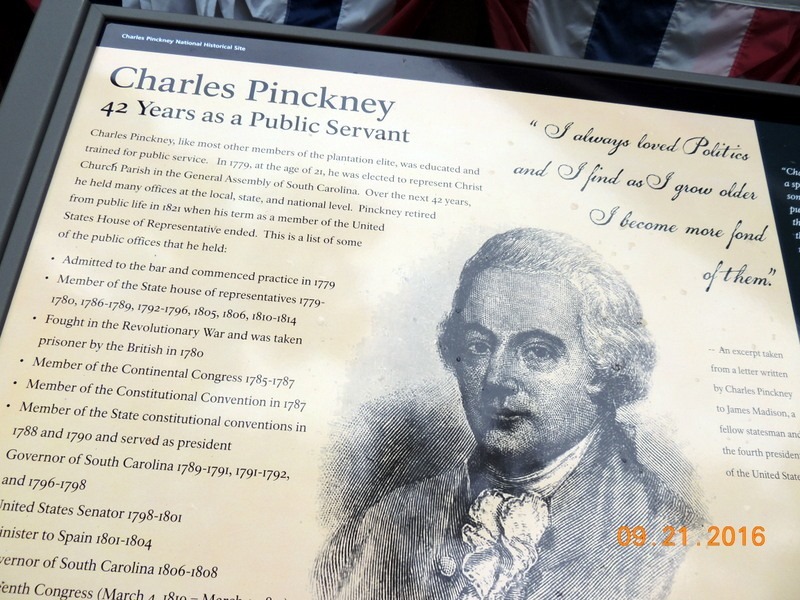 We stopped at the Pinckney NHS first. This is a small park. 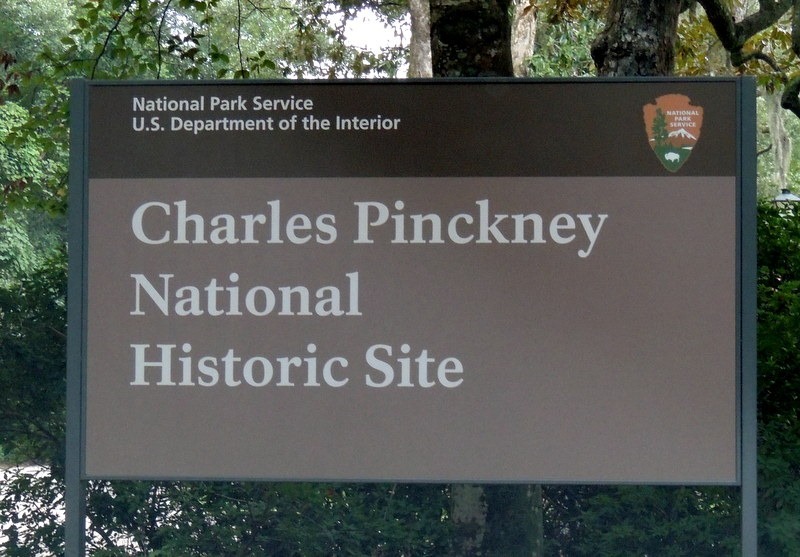 We found this sign at the entrance delineating Pinckney’s accomplishments. He was instrumental in many of the items that are in the Constitution, although James Madison is given credit for the constitution. Here is the list of Pinckney’s items that made it into the document. He was only 28 years old when he was unanimously elected to the Legislature. That was because only 2 people voted, his overseer and himself! Anyway, James Madison hated him, and I think it was because he was a southern gentleman, like the guide we had yesterday, who was a jerk. But he made significant contributions to the Constitution which are still there today and really were the basis for our government. 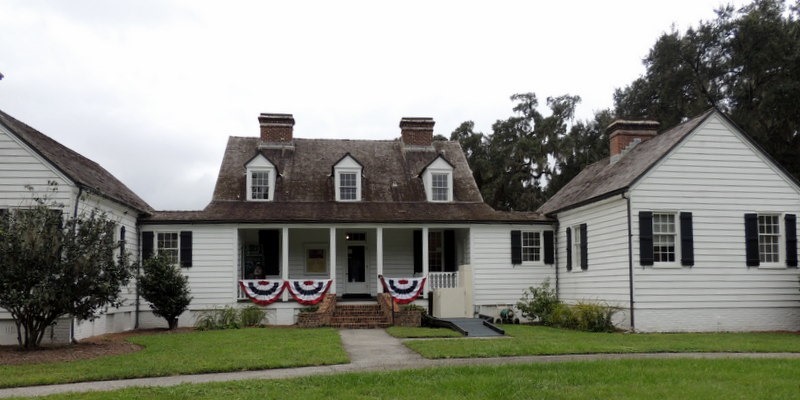 We watched the 17 minute movie, viewed the small museum, and left to go across the road to the Boone Hall Plantation. We parked and went to the visitor center. We signed up for the next house tour, which was at 11:30. 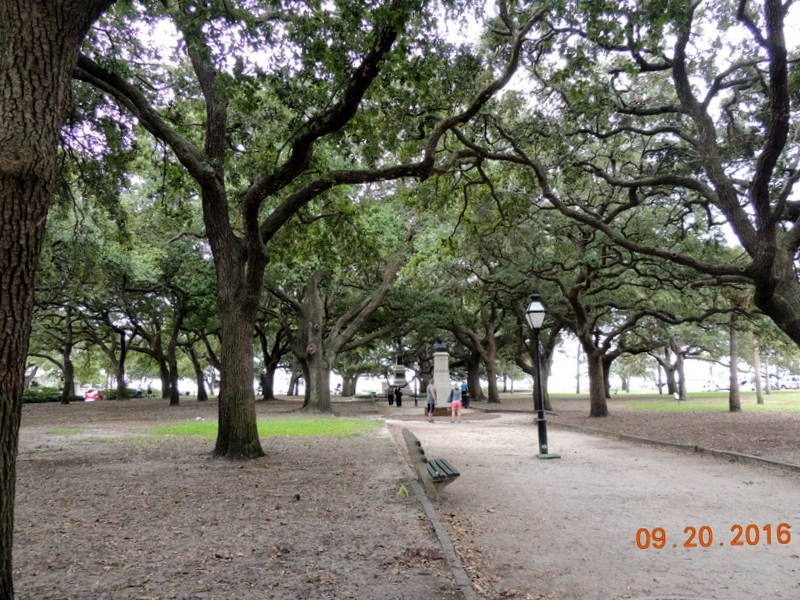 We had about an hour, so we wandered over to Slave Row. There were more of these cabins originally, but these are all that are left. These were the cabins for the house slaves and the trained slaves, like the black smith.The field slaves lived in cabins closer to the fields. Below is the church. 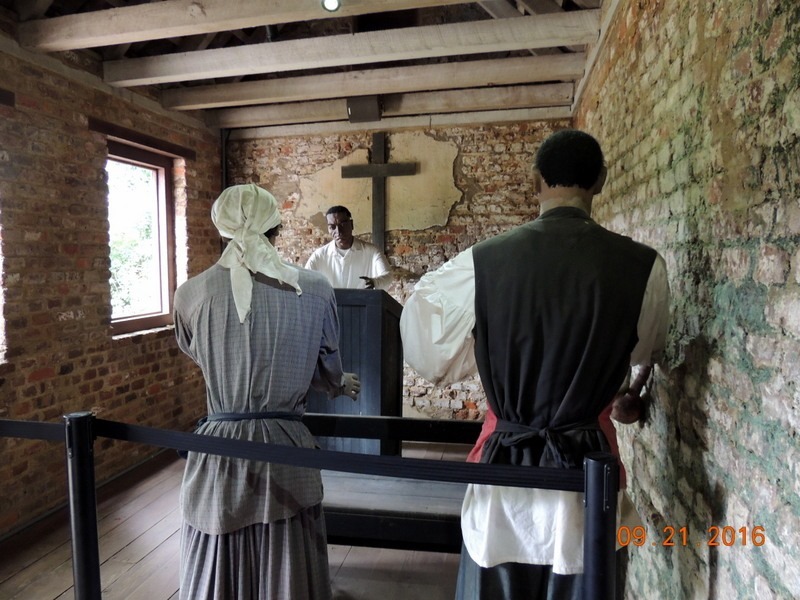 There was an audio running which explained what the church was like and the rules for the slaves. 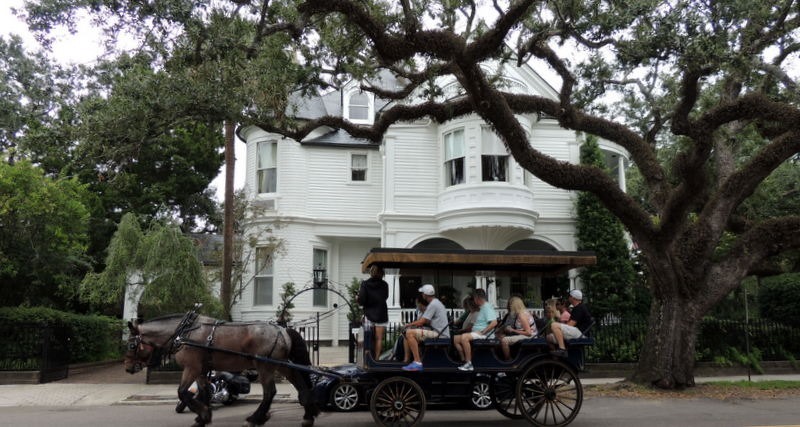 As we left, we saw the plantation coach coming up the driveway, so we walked over to board the coach for the tour. We took our seats and the guide/driver, who was entertaining, took us on a 30 minute tour of the plantation. 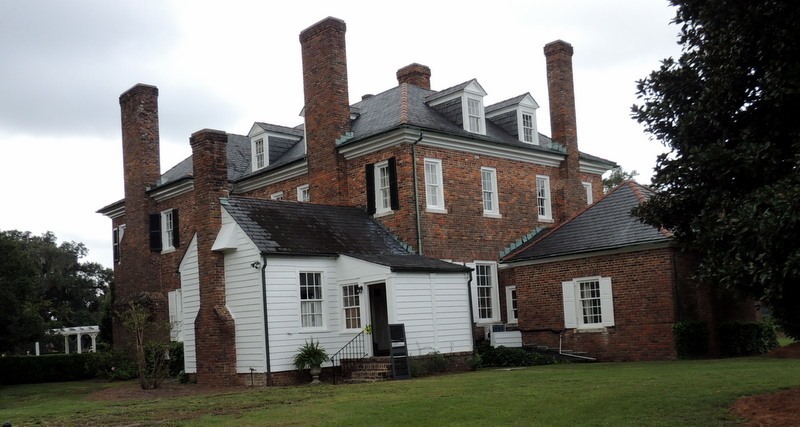 The plantation was originally over 4,000 acres, but is now down to 780. The road the coach took was right along back yards of some of the housing developments in the area. Above is the back of the house. 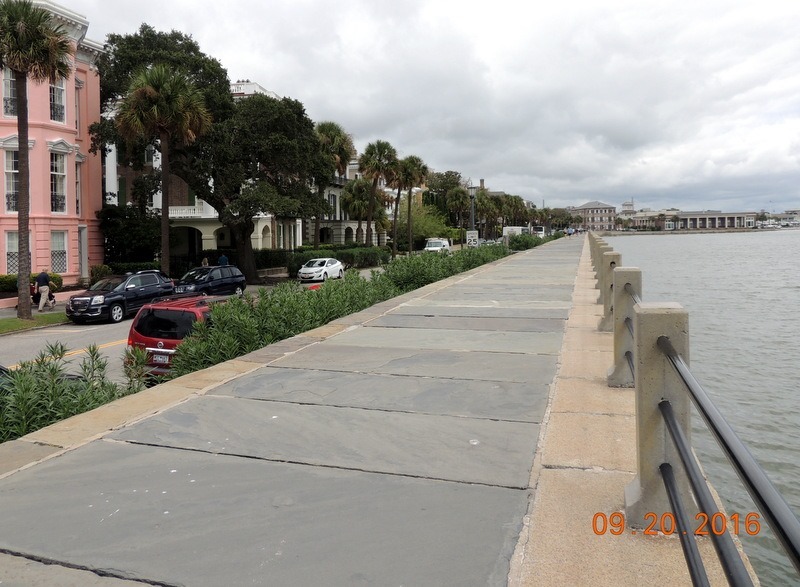 As with all the plantations, it is located on costal water, which is how they were able to get their products to Charleston. 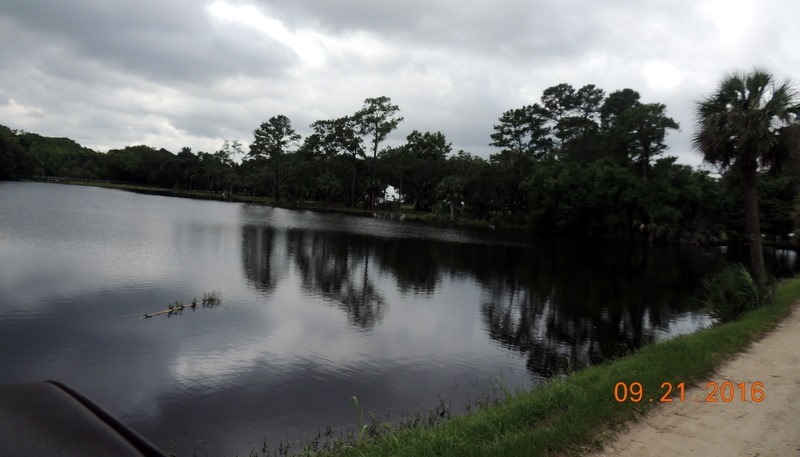 This is the fresh water lake, which had alligators. 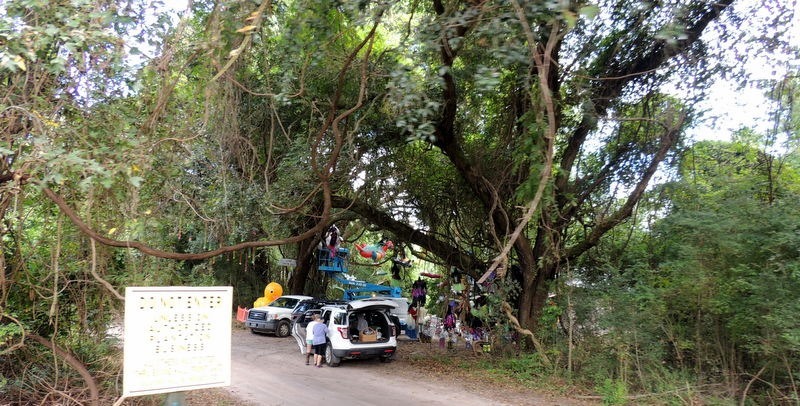 Above, volunteers were setting up for Halloween. 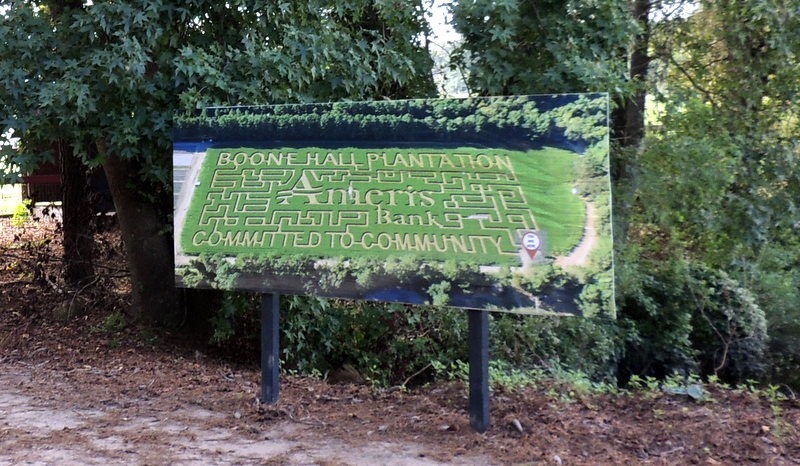 They also have a corn maze. The corn is short right now, but is a fast growing variety. This is a working plantation. 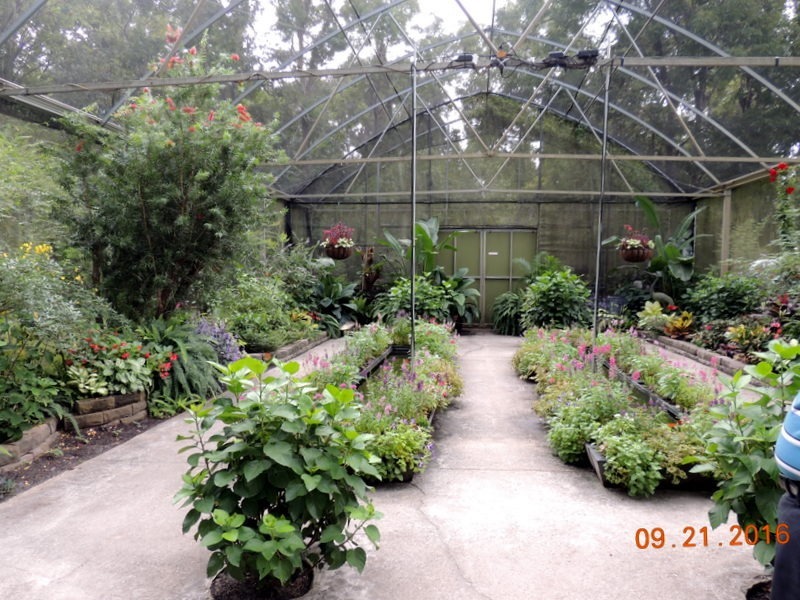 They grow many products, corn, okra, cotton, several varieties of squash, peaches, blueberries, strawberries-which grew this year from December to May! 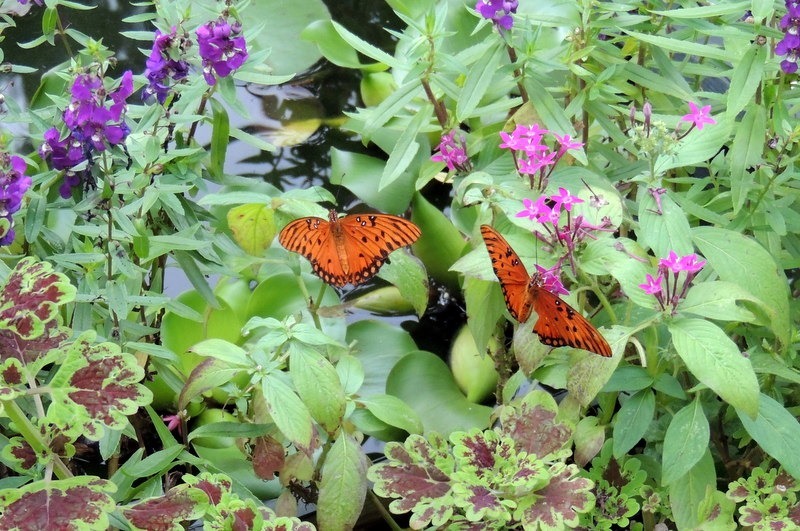 The garden is designed in the shape of two butterfly wings. 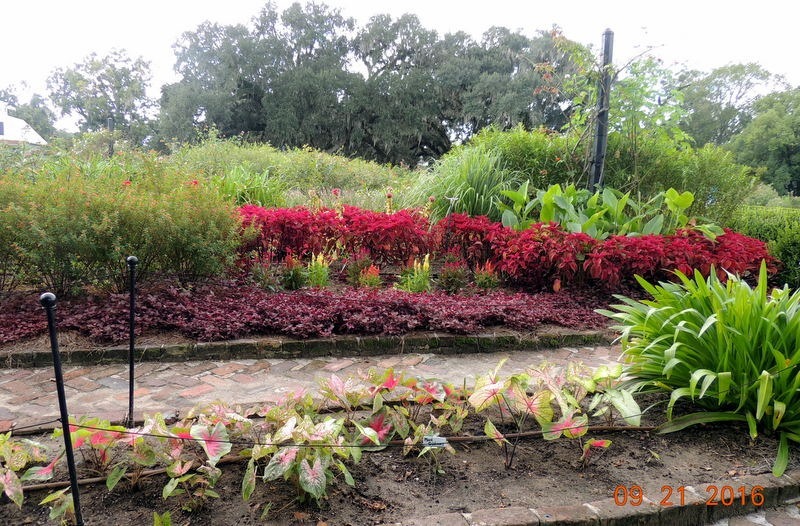 It is composed of 22 beds of historical plants and flowers. 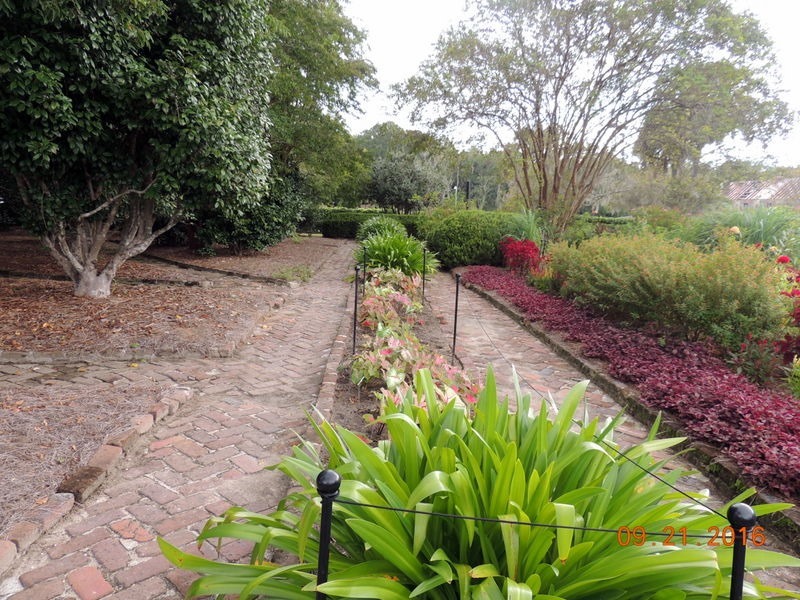 The Noisette class of roses originated in Charleston and is a specialty on the Plantation. 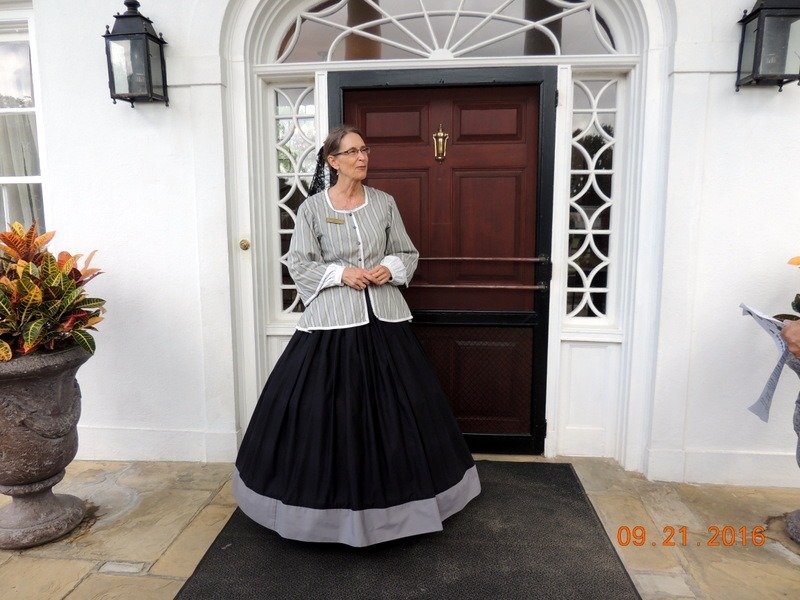 This is our tour guide for the house tour, Pam. She was very good! Unfortunately, no pictures were allowed in the house. The tour had 50 people on it, one of the largest we have taken. The tour took about 45 minutes and only consisted of the first floor. 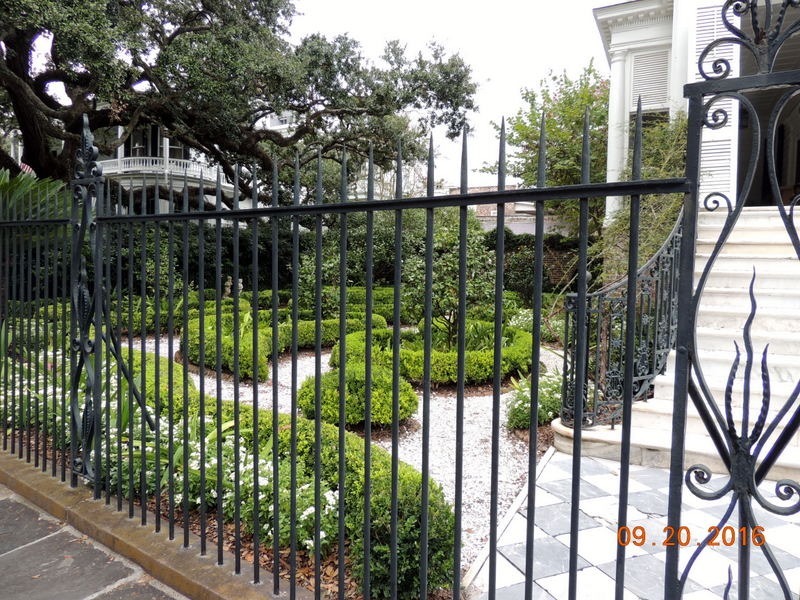 The plantation is privately owned, by a brother and sister. The brother lives onsite and is in his 60’s. The sister lives elsewhere and visits occasionally, staying in the house on the second floor. She is in her 70’s. The house is air conditioned. I asked Pam what the plans were for the plantation, as the family members are older, and she said that they do not know and are afraid to ask. 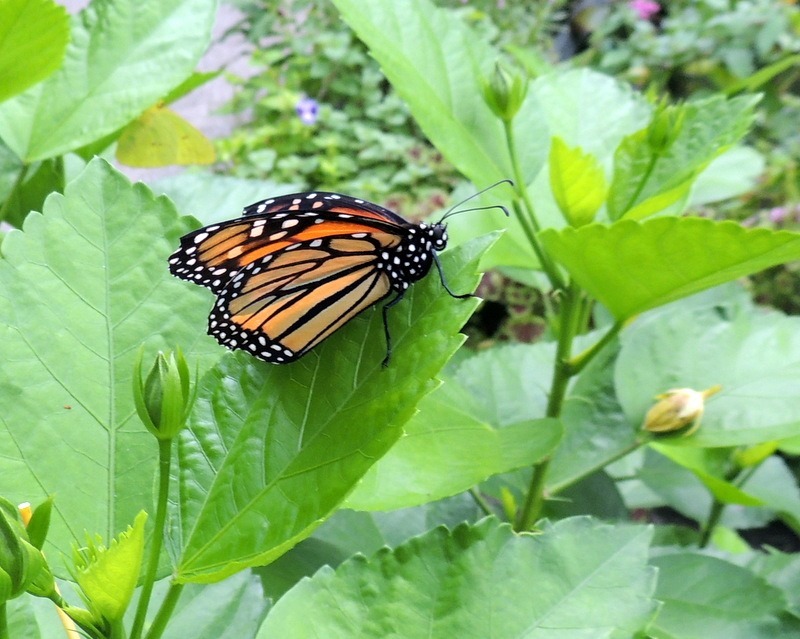 We walked back over to the Butterfly Pavilion/ café /gift shop. 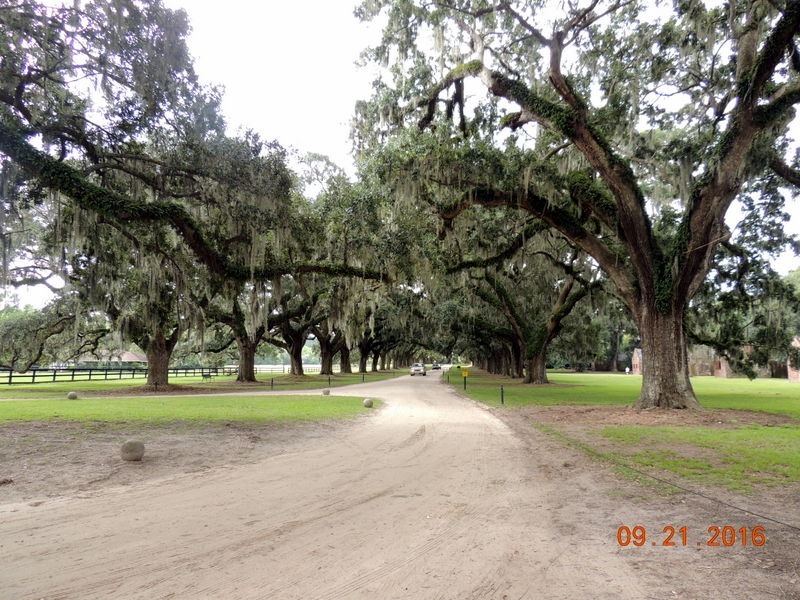 We left and went to the Boone Hall Plantation Farm Market and Café. We ate lunch there. The food was mediocre and the service was terrible. We would not recommend it. We wandered through the market, buying some vegetables, strawberry and blackberry cider, and a bottle of Stout. We left and went to Costco, then back to the MH. We ate leftovers for dinner, watched TV, read and went to bed. Thursday- Moving day! Gosh, we hated to leave Charleston. We only touched the surface of the city and surrounding area. We will have to return in the future! We drove south on I-25 to I-526. We turned southwest onto Rt. 17 and followed it to I-95. We stopped for lunch at the Georgia Visitor Center, which was under construction. This is when it is nice to travel with your home, we have our own bathrooms and kitchen! We continued south and turned north on I-16 traveling to Statesboro GA. We settled into Parkwood RV park, where we have stayed before. $33.30 per night with our Good Sam discount, FHU 50 amp. We settled in. We took the dogs and went to visit friends Jackie and Dr. Bob Hoell. Dr. Bob was at work until after 6, but Jackie was home. They have two dogs, one of which is new. Our dogs recognized their old dog, Trinity, and met Tasha the new family member. After the excitement, they all settled in nicely. We had dinner, thank you Jackie, and sat talking until almost 9. We left and returned home. Friday- We did a lot of tasks around the MH. We had picked up a bunch of packages at the Hoell’s, so we opened them and put items away. Bob worked on the windshield wiper and I made some reservations. 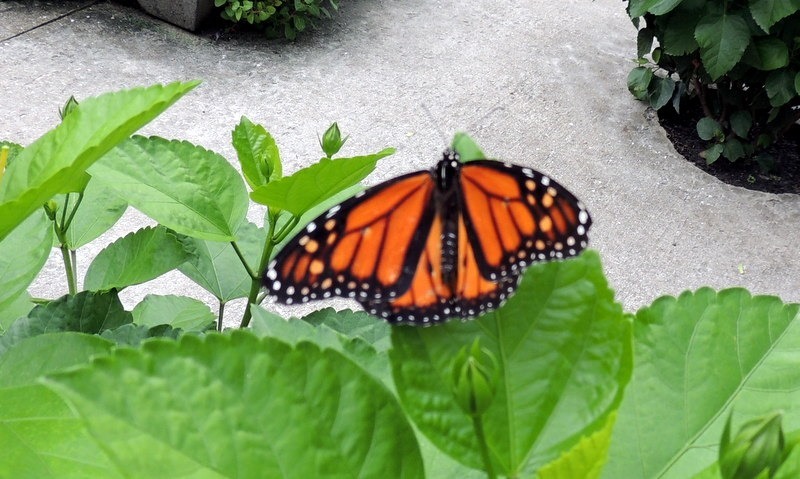 I did laundry and worked on the blog, plus made some phone calls. At 11, Jackie picked us up and off we went to pick-up her in-laws, Herb and Lucille at their Assisted Living Facility. We went to lunch at McAllister’s Deli. Dr. Bob, who had to work today, joined us. After a nice lunch, we went to the Walmart Neighborhood Pharmacy, then off to the bank and we returned Herb and Lucille to their Assisted Living Facility. We toured the very nice facility. We left and Jackie dropped us back at the MH. We put away our items and took the dogs with us to Jackie and Dr. Bob’s house. Bob and Jackie went to pick up their trailer which was in for repair, while I stayed at the house with the dogs. They returned and we talked and watched a recorded TV show. At 5,Bob and I returned the dogs to the MH and fed them. Dr. Bob and Jackie picked us up and we went to the local Carmikes theaters to the Mugs and Movies to see the Magnificent 7. We ate dinner during the movie and they dropped us back at the MH at about 10 PM.